When you look at your neighbor's yard, perhaps you say to yourself, "The grass is always greener on the other side." Well, don't despair. If you check for excessive thatch, give your lawn enough water, and learn how to mow and use lawn fertilizers properly, the grass will be greener on both sides of the fence (and maybe even a little greener on your side). Thatch is a naturally occurring layer of primarily dead grass the lies on top of the soil of your lawn. It is made up of undecomposed stems, stolons, rhizomes, and roots. If the thatch layer gets to be more than about 1/2 inch thick, it can be unhealthy for your grass and should be removed through a process called dethatching. If your lawn's thatch buildup is right around 1/2 inch, you have a minor lawn thatch problem that is fairly easy to deal with. A thick layer (say, 3/4 inch or more) calls for the use of a core aerator or a vertical mower. Both can be rented from your local rental center. What's the yearly rainfall to be expected in your region? In dry climates, installing an irrigation system is necessary for growing grass successfully. But, in the misty Pacific Northwest, it is understandable that many choose to let Mother Nature do the watering. For most of the rest of us, the decision of whether or not to have an irrigation system for watering lawns will not be so clear-cut. Cost is often the primary factor, but keep in mind that in the long run, an irrigation system may save you money because it is more efficient than other ways of watering. Whichever method you choose, your grass must have enough water on a consistent schedule to remain green and healthy. While overwatering can lead to its own problems, an under-watered lawn lacks the vigor and resilience to compete with weeds and diseases, not to mention staying green. We know we have to fertilize the tomato plants in our gardens or the houseplants on our window sills. But it's easy to overlook the necessity of spreading fertilizers over our grass. Perhaps it is because the individual grass plants work in unison, together forming something we know as "the lawn." But it's more accurate to think of a lawn as millions of individual plants that need to be fed on a regular basis. Fertilizing your lawn goes hand-in-hand with lawn weed control. As your grass takes in the fertilizer's nutrients, its root system will expand and begin to cover any bare spots. Weed seeds count on those bare spots to take hold. When you remove those spots, you're hitting weeds where it really hurts. Ideally, thanks to your fertilizing and other maintenance efforts, you'll get to a point where your grass is so healthy that it crowds out most weeds. The best way to satisfy your turf plants' hunger is with slow-release fertilizers, which extend the feeding period and are less likely to burn grass than other formulas. You may also opt to feed your grass and control weeds at the same time, using a "weed and feed" fertilizer, which is essentially food for grass and poison for weeds. Keep in mind that these fertilizers are not organic and can be applied only twice a year, typically. The Scotts company, a major fertilizer manufacturer, recommends applying lawn fertilizers in four stages. The exact dates will, of course, vary from region to region. Another factor is the kind of grass you grow. So always read the package labels carefully before applying, and pick the brains of the staff at local garden centers or a local extension service. As an example of a typical fertilizer schedule, if you live in the northeastern United States and if your lawn is a mix of cool-season grasses, you might begin by feeding the grass in May with a product that contains a pre-emergent to prevent crabgrass from growing. Follow that up in June with another lawn fertilizer that performs two jobs at once. In this case, the other job (besides fertilizing) is controlling broad-leaved weeds. For the latter, you need a product that contains a post-emergent herbicide designed to kill weeds that have begun growing in your lawn. In mid-summer, bugs and drought are two of the greatest enemies of your grass. Scotts puts out a lawn fertilizer called "SummerGuard" to address these issues. It's designed to fight chinch bugs and many others, including the deer ticks that carry Lyme Disease (note, however, that to kill ticks in brushy areas of your landscaping, you'll have to spray with other products). According to the company, it also improves the ability of your grass "to absorb water and nutrients." Last but not least, when you winterize your yard in autumn, don't forget your grass. It's not difficult to remember which fertilizers to shop for at this time, because they will often contain "winterizer" in their names. These products are designed to help your grass build a deeper root system to weather the winter. But make sure you study the label of a winterizer bag before buying so that you can learn the nitrogen-phosphorous-potassium, or NPK, content. In The Myth of "Winterizer" Fertilizer, Robert Cox, Cooperative Extension Agent for Colorado State University, warns that such lawn fertilizers will fail to enhance the winter hardiness of your grass unless they are sufficiently high in nitrogen. Suggesting the use of a fertilizer with an NPK of 25-5-5 (or thereabouts), Cox goes so far as to state, "Nitrogen applied in the fall is the most important lawn fertilization of the year." For those who prefer to landscape organically, applications of compost will be the answer (or at least a big part of it). If you keep your grass well-fed with compost, it has a better chance of crowding weeds out (and avoiding pest invasions, too). To practice organic lawn-weed control on the weeds that do emerge, you'll have to resort to good, old-fashioned hand-pulling. If you choose this route, water the area first since weeds come out of wet soil more easily than out of dry ground. According to the Cornell University Cooperative Extension, cutting the lawn with a mower set at a proper mowing height can save you from having to bag your grass clippings, even if you don't own a mulching mower. The rule of thumb suggested by the Cornell Extension is, "Mow when your grass is dry and 3 to 3-1/2 inches tall. Never cut it shorter than 2 to 2-1/2 inches or remove more than one-third of the leaf surface at any one mowing." Following this mowing tip means more frequent cutting, to be sure. But the result will be a healthier lawn that is fed by nutrients that you would otherwise be hauling away. Cutting a lawn too short can stress it out, especially during periods of hot weather. 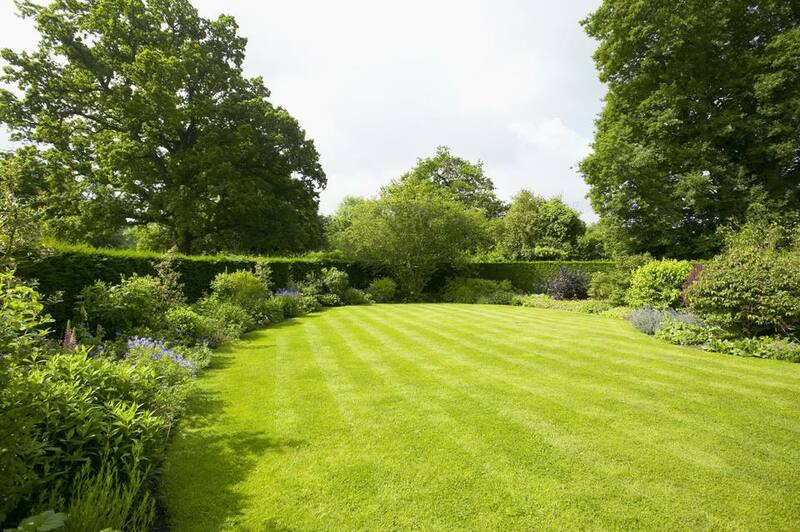 In addition, cutting the lawn stimulates growth and increases thickness. You are, in effect, "pinching" your grass plants each time you mow, just as you pinch many houseplants or garden flowers to make them sturdier plants. Note that with mulching mowers, you don't need to be quite so careful about the height at which you cut the lawn since the grass clippings are shredded up more finely. This works much better for those of us who don't generally walk around with tape measures on our belts.